Elk River, MN– August 24, 2011 – Occupational Therapy (OT) and Special Education (SPED) Editions are now available for the research-based handwriting solution ez Write. With these kits, districts can create a complete and fully aligned handwriting curriculum for all of their pre-school (age 3) up to 5th grade students, including those with special needs. The ez Write OT and SPED Editions are fully customizable based on the needs of the particular student; yet so easy to use that even entry-level teachers will quickly be able to master the program. These kits include extra materials designed especially for OT and SPED teachers and students such as pencil grips, sensory activities, a travel bag and a sensory bin. The SPED/OT kits make it easier to include special needs students in the regular education classroom; a benefit to all. ez Write is a research-based, developmentally appropriate handwriting program that engages all learning styles. Easy to use and easy to implement, the program encourages “automaticity” or the ability of students to retrieve and produce letters automatically. It is based on research showing that handwriting competency can have dramatic effects on academic achievement and self-esteem. Introduced in the fall of 2010, ez Write has already been adopted by over 50 schools and learning centers, and is the core handwriting curriculum for nearly 8000 students. Grade-level specific packages come complete with everything a teacher will need to implement a great handwriting curriculum in their classroom in a very short time. Now, with the addition of the OT and SPED additions, teachers can better customize the lessons to meet individual student needs. There is even a training DVD for teachers as well as teacher worksheets and training guides and worksheets for helpers. In addition, budget conscious schools will appreciate how affordable ez Write is to acquire and maintain. ez Write is a research-based, developmentally appropriate handwriting program that engages all learning styles. Easy to use and easy to implement, the program encourages “automaticity” or the ability of students to retrieve and produce letters automatically. It is based on research showing that handwriting competency can have dramatic effects on academic achievement and self-esteem. Multi-sensory and multi-disciplinary activities as well as a strong school/home connection are also key ingredients to ez Write. Research has shown that the more children (and adults) have to focus on the process of handwriting the less capacity they have for higher-level processes such as idea generation, vocabulary and creativity. ez Write seeks to make handwriting as automatic as possible to allow the child to reach their potential in written language as well as higher levels in other areas. Elk River, MN – September 12, 2012 – ez Write, the researched and engaging handwriting program for young children, is the handwriting curriculum used throughout the Elk River School District and the district’s Early Childhood Family Education; and Early Childhood Special Education programs. It is also used at many Elk River area child development centers, preschools and day-care sites, including Reach-up Head Start. Now, the positive effects from ez Write are being noticed in the Elk River Kindergarten classrooms. Kindergarten teachers have found that their incoming students who have used ez Write arrive with a good basic handwriting foundation, allowing these teachers to begin their literacy curriculum earlier. ez Write is a research-based, developmental-appropriate handwriting program that engages all learning styles. Easy to use and easy to implement, ez Write helps to develop “automaticity” or the ability of students to retrieve and produce letters automatically. It is based on research showing that handwriting competency can have dramatic effects on academic achievement and self-esteem. Multi-sensory and multi-disciplinary activities as well as a strong home/school connection are also key ingredients to ez Write. Pilot program adopters of ez Write have seen dramatic and lasting results. After just 3 months of using ez Write, one 1st grade class experienced an 80% increase in letters per minute (LPM), and 2nd graders using ez Write were tested as a higher LPM than 5th graders who had not been part of the program. Legibility also improved dramatically with ez Write. 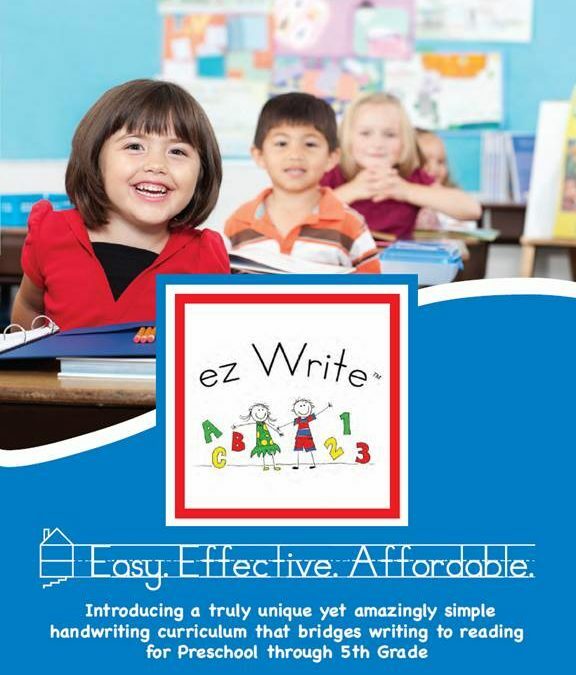 Elk River, MN – October 10, 2012 – ez Write, the researched and engaging handwriting program for young children, has completed its second year with strong growth in both the preschool and elementary markets. ez Write is now part of learning in 17 states, with almost 600 classroom kits from Preschool through 5th Grade being used to teach handwriting to over 16,000 students in 34 public, 5 charter, 5 private, 83 preschool and 20 home schools. ez Write is a research-based, developmentally appropriate handwriting program that engages all learning styles. Easy to use and easy to implement, the program encourages “automaticity” or the ability of students to retrieve and produce letters automatically. It is based on research showing that handwriting competency can have dramatic effects on academic achievement and self-esteem. Multi-sensory and multi-disciplinary activities as well as a strong school/home connection are also key ingredients of ez Write. Research has shown that the more children (and adults) have to focus on the process of handwriting the less capacity they have for the higher-level processes such as idea generation, vocabulary and creativity. ez Write seeks t make handwriting as automatic as possible to allow the child to reach their potential in written language as well as higher levels in other areas. Pilot program adopters of ez Write have seen dramatic and lasting results. After just 3 months of using ez Write, one 1st grade class experienced an 80% increase in letters per minute (LPM) than 5th graders who had not been part of the program. Legibility also improved dramatically with ez Write. The signature and cursive handwriting are in danger of fading away. 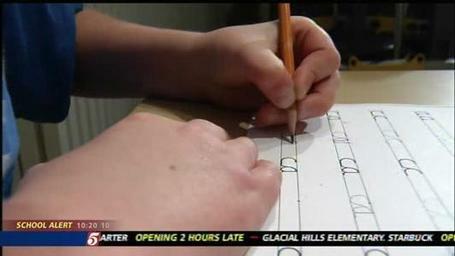 In Minnesota, schools are no longer required to teach cursive. But it’s not just the signature that’s taking a hit, the way students learn and how their brains develop could suffer. But they appear headed for divorce. Several states including Illinois, Indiana and Hawaii don’t teach cursive. Minnesota no longer requires schools to teach cursive. The Department of Education says most districts still choose to teach it, but they spent less time on the cursive – kids are using keyboards much more. The state follows a national standard called the Common Core. It says students must know keyboarding by fifth grade, but doesn’t even mention cursive. At least 46 states have adopted the standards. Most Minnesota kids are learning cursive in second or third grade, but by fifth grade they turn to typing full time. Most never have to look back. Researchers say it’s not about whether typing or cursive is more important. Learning cursive actually helps a child’s brain development. Doctors at Indiana University used MRI’s to look at children’s brains and found more activity when they were writing versus typing and researchers from Vanderbilt got similar results, seeing kids brains light up less in front of a keyboard. Doctors say cursive handwriting, more than printing, stimulates intelligence and language fluency. Fluent writing keeps kids from truncating their thoughts. The Department of Education says they are always reevaluating their policies. They may reexamine their cursive policy if schools stop using it.